Vallourec & Mannesmann Tubes (Oil & Gas division), France are the leading players in Oil Country Tubular Goods (OCTG). They have manufacturing facilities in France, Germany, USA, Brazil, China etc. 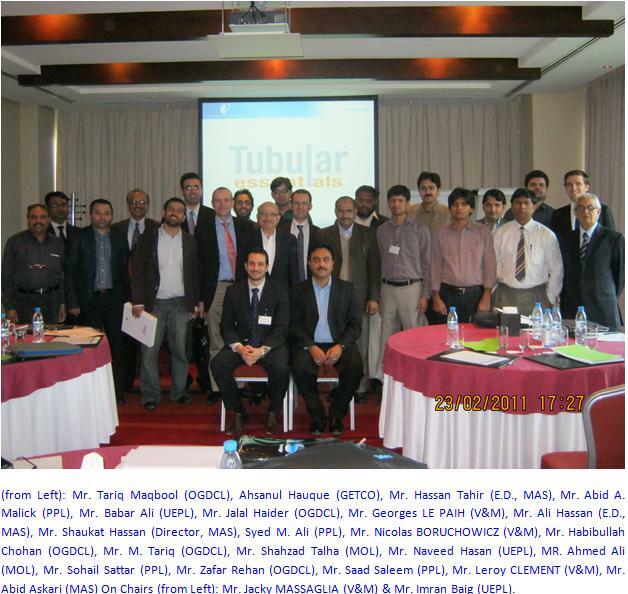 In view of the changing technologies and drilling challenges, V&M, in association with MAS associates (Pvt) Ltd. organized a 2 days’ Seminar at Dubai on 22nd & 23rd of February, 2012, specifically for the E&P Companies operating in Pakistan. The agenda of the Workshop was to define the essential steps towards selecting the best OCTG for drilling/production operations. Also, to introduce the new developing technologies and to share experience with the operators which have been encountered in the other parts of the globe. The Seminar was very well attended and was much appreciated by the delegation visiting from Pakistan. Special thanks to all the participants for participation and making the Seminar successful as well as the V&M delegation which travelled from France to conduct the same!